A drive-by design review isn't really a much of a review. It's more like a knee-jerk opinion to something in the wild. Unfair? Perhaps, design is after all a solution and observing things in the field prevents us from getting the full context the designers/implementors faced. That said, maybe it's useful to consider the first-impulse reaction to a particular design choice. Judge for yourself. Anyone who even glances at America's premier business newspaper, The Wall Street Journal, has seen the 10-Point column.. Running proudly down the left margin, the column summarizes the most important events reported in the edition of that day. In the digital age, this column is augmented by a daily email that recasts the column's content, replete with links and sidebars, for consumption on the run on a mobile device. The email itself is great, strongly fit for purpose, and retaining the specific personality of the column as it appears in its print and web-based versions. It's the little Editor's Note at the conclusion of the email that is our subject today. Here it is (with a little aqua box added for emphasis). In case the image is too difficult to read, I'll repeat gist of the text here. The 10-Point is now a WSJ member benefit. If you receive our flagship newsletter and are not a member, we'll continue sending it to you for now. To ensure you don't miss out.... OK, that's enough to work with. First off, understand that I really like the email and I appreciate that the WSJ is trying to tell me something important. It's just a bit hard to parse out what they mean. So let's break it down. [ a member benefit ] - first thought bubble on reading this: am I a member? I actually don't know; WSJ has tiered their account types in connection with a paywall and it's never been clear to me what tier I belong to. I'm confused. [ our flagship newsletter ] - next thought bubble: this newsletter? I'm actually not sure as I already receive multiple email letters from WSJ. I'm more confused. [ not a member ] - see remark #1 above, but now there is some frustration. Why can't WSJ figure out if I'm a member? Why leave that to me? [ continue sending it to you for now ] - strong thought bubble: Hmm, OK. So you are basically saying at some point in the future I could lose this little nugget of goodness in my digital life. Or maybe not if I'm the right type of member. So in the course of seemingly trying to help me, WSJ has instead left me feeling a bit annoyed. 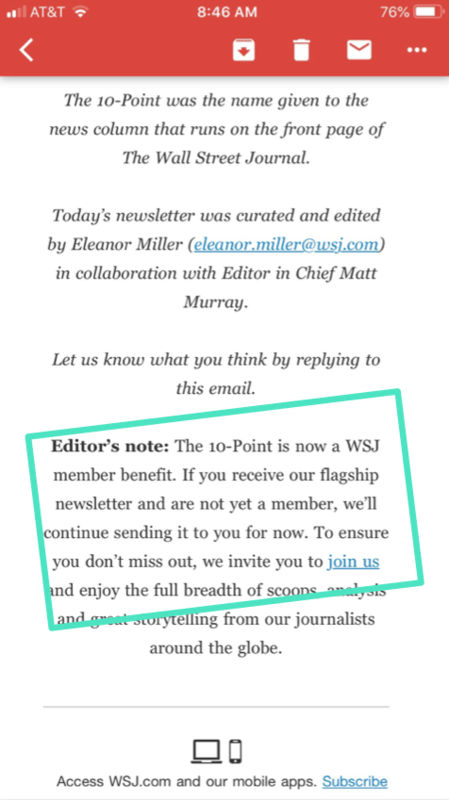 First, I am not sure what level of "membership" I have in the WSJ digital-universe; my expectation is that because it's their club and they make the rules, they ought to make it easy for me to know -- like by disclosing my account status with me in the text of the Editor's Note. Second, it's all too easy to forget consumers of your content know a lot less about it and how it fits into your organization's portfolio than you do. I think that's happening here. Why not clearly state what the flagship newletter really is. Finally, there is something unnecessarily parental in saying for now. It comes across as passive aggressive, as if the WSJ were shaking its head and saying "have it YOUR way", but promising vengeance in the future. Over an email. And to a customer that very likely spends several hundred US dollars with your organization each year. Even the smallest bit of content counts. No matter our intentions, it's precariously easy to violate the law of Don't Make Me Think, which in this case pretty much reverts the intention to help to a negative impression. If your organization makes the rules and the terms and the conditions, that's totally fine. Just don't expect your busy customers to perceive them as you do.